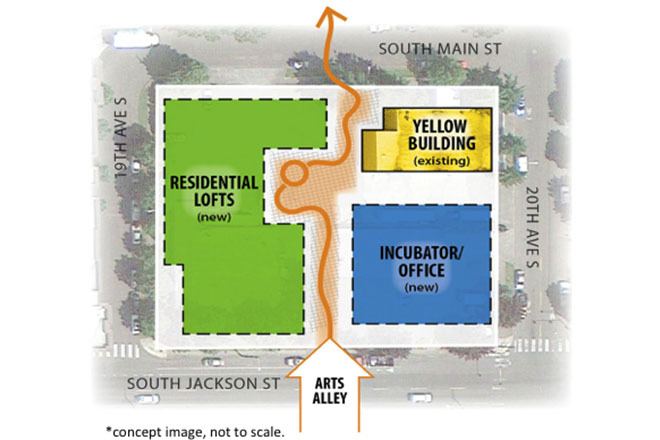 Seattle, September 16, 2013 – Pratt Fine Arts Center is soliciting proposals for the creation of a dynamic arts based community on the non-profit’s Central District property in Seattle. In leveraging its physical assets and its role as a creative focal point in the city to the project, Pratt expects to establish a vibrant new home for the city’s creative community. The new development, covering four-fifths of the city block owned by Pratt, will include a mix of housing, independent artist studios, live/work units, gallery, retail and office space as well as approximately 15,000 square feet of space for Pratt’s publicly accessible art-making facilities. A core element of the project will be the creation of a pedestrian “Arts Alley” connecting all of these components to create a public arts experience across the redeveloped block. The development program is envisioned as two complementary projects across the 42,640 square foot site: a residential lofts building and an incubator/office structure. The land for these projects may be acquired and developed together or separately, and will continue to share the block with an existing classroom building, which currently houses the art center’s printmaking, letterpress, painting and drawing studios. Galatro and a committee led by Seattle architect and Pratt board president Bob Swain worked with advisory firm Heartland, LLC, to develop a detailed offering memorandum for the project. Heartland recently developed a long-term growth plan for The Polyclinic to enable the healthcare provider to expand its services, and has worked to develop and implement a plan to create a world-class mixed-income community at Yesler Terrace for Seattle Housing Authority. The Pratt offering memorandum was distributed to developers across the United States in early September, with proposals due from interested parties on October 11, 2013. About Pratt Fine Arts Center: Pratt Fine Arts Center is an eclectic, hands-on learning and working environment serving students, hobbyists, and professional artists throughout Seattle and the Pacific Northwest. Founded in Seattle in 1976, Pratt is the only facility in the Northwest where absolute beginners and established artists work side-by-side creating art. Affordable studios with unparalleled equipment offer artists of all ages, abilities and backgrounds with the opportunity to learn, experiment, and create. Pratt is a 501(c)(3) non-profit organization. About Heartland, LLC: Heartland, LLC is a Seattle-based real estate advisory and investment firm with over 28 years of experience designing, analyzing and implementing strategies to manage risk and optimize value in all aspects of the built and natural environment. Our business lines include public sector and private sector real estate consulting, brokerage, capital markets and investment. For more information, please contact Matt Anderson (manderson@htland.com), or Katlin Jackson (kjackson@htland.com) at Heartland, (206) 682-2500.